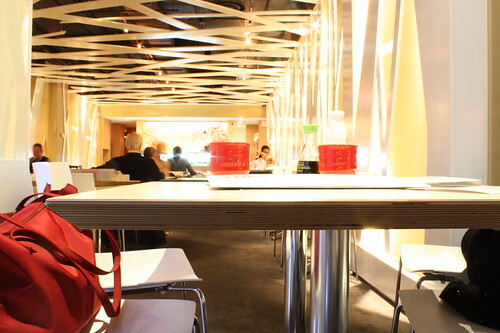 Ginza Sushi is located in Yorkville, just steps from the Bay subway station. This is one of their three locations in Toronto. Delivery is available. Please read our conversational review, below. One of our fellow readers Walter, wanted to hear our thoughts on this place. I’ve walked past it a few times when I was in the Yorkville area and have been interested in trying it. Thanks to Walter for giving us the added “push” to go. Ah, yes… Walter said in a note to us “I’d be curious to hear your thoughts” about Ginza. I’m not sure if that’s good or bad. Either way we took the plunge. And, hey, it’s Yorkville so can it be that bad? Meet up time was on a Tuesday at 5:30. I was late due to the whole TTC ticket-replacing-tokens fiasco. Ok, I should have planned better. Anyway, the place was actually pretty much empty. Nice restaurant, actually, but I think we were only one of two (maybe three) tables of people. I won’t even comment on the TTC (you can look at my past comments on it). Yeah the place was pretty dead when I arrived but then again, it’s 5:30 pm on a Tuesday. It did start to fill up as the evening went on. We were seated right by the window in one of the corners. The place is carpeted and has a new modern look/feel to it. Definitely not in a traditional Japanese style. I guess it’s attempting to cater to the Yorkville clientele. 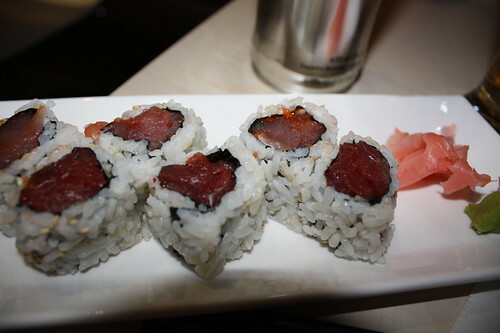 Regardless, the menu had a lot of variety and various fusion type rolls. What I did notice too is that it also has a Thai food section. 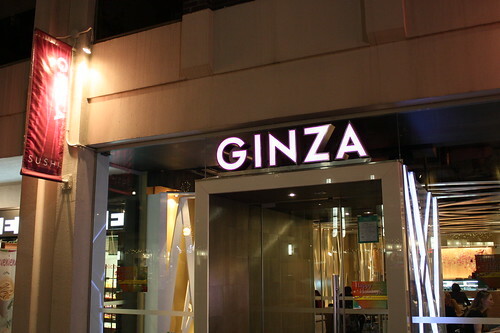 Ginza apparently is a Japanese Sushi and Thai restaurant? I’m guessing that’s not a good sign. Anyway, let’s get down to the grub. We decided to go all rolls plus the sushi pizza. First up, for the rolls, was the ‘signature’ Ginza Roll (soft shell crab, tempura shrimps, BBQ eel, tobiko, avocado, cucumber, asparagus, green onions and mayo). 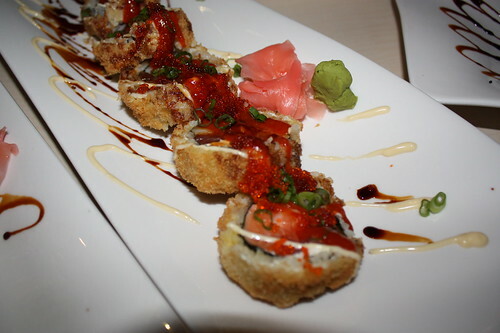 Agreed on the Ginza roll – nothing special. I was expecting to much better based on the presentation. Ditto for the other two signature rolls. 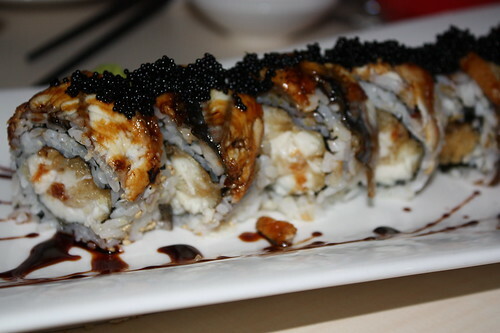 The Moscow Roll ($10) was almost impossible to eat without making a mess. When I eat sushi I want a comfortable eating experience to really enjoy it. If I have to take two bites to get through a piece or have it spilling all over my plate it really ruins it for me. The Moscow wasn’t amazing, that’s for sure. Why did it remind me of onion rings? I put it at average at best. The Black Pearl ($15) didn’t do anything for me either. I’m not sure if I was having an ‘off’ night or what but none of these rolls really did anything for me. The Spicy Tuna rolls were the final roll we ordered. They were average as well. My pint of Sapporo was good though! It seemed they spent more time on the presentation then the taste. I guess it fits within the Yorkville image. 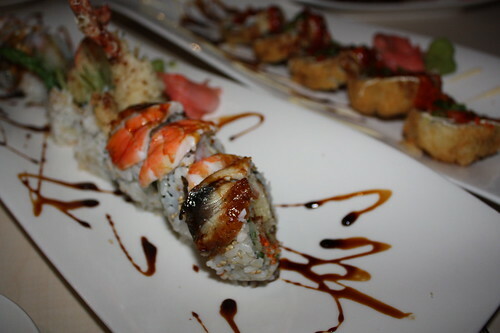 The various specialty rolls we ordered and the sushi pizza looked great but it just didn’t translate to the taste. They were okay but there was too many different flavours and ingredients combined into one. After trying them, I couldn’t really tell if I liked it or didn’t. I have to agree with you, even as a seasoned chopstick veteran, handling these huge size rolls was pretty challenging without making a huge mess. It’s almost like they should have given us a knife and fork as well. 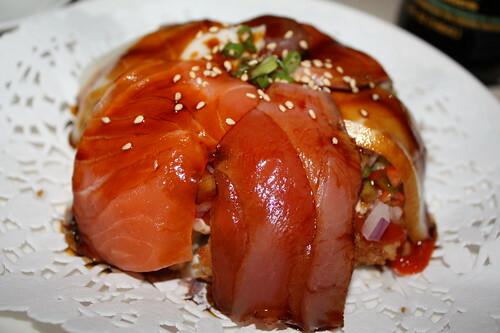 The Salmon Sushi Pizza ($8) was decent – and was the tastiest thing we ate. Afterward our waitress asked if we wanted ice cream. Not knowing whether that was extra or not we went for it anyway. I went Mango and you went Green Tea. Ah yes the ice cream. You know my stance on free ice cream. An immediate +0.5 on the rating scale! Let’s see what happens when we get the bill. 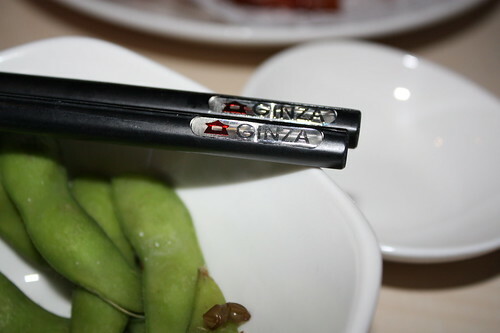 It could be a determining factor in my review of Ginza. Hehe… annnnnnnnnnnnnnnnnnnnnnnnnnnnnnnnnd, free ice cream! 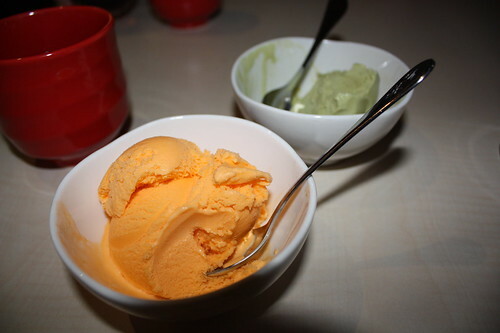 No extra charge for the ice cream, which was nice (but, I may add, seems to be standard at many sushi places). We also had a special guest as part of the Sushi Toronto team this time around. Our guest decided to take advantage of the 2 for 1 martinis! I don’t recall which ones but the review was ‘yum’ (paraphrased) I believe. I believe it was called the “Ginzatini” or something like that and it “tasted like candy”. Well I am a sucker for free ice cream so bribes are always welcome for any future sushi restaurants we go to. In the end the place had a very chic modern decor with friendly service and what appeared to be a slick unique menu but it just missed the mark for me. Maybe it’s the perfect fit for the Yorkville residents…I don’t know… I am aching to get back to some traditional sushi and sushi rolls prepared fresh and done right. 6.5 / 10 for me. Of course the extra 0.5 for the free ice cream. Agreed. The restaurant environment was great. Clean and modern with good, friendly service. All was good except for the actual food. Too bad, really. I suppose we made it a bit difficult in choosing mostly all ‘signature’ rolls, but, really, your ‘signature’ rolls should be your best stuff. They looked good but dropped the ball on the taste factor and the fact that they’re difficult to eat ‘properly’. I can’t believe I’m going to join you on this one, again, but I can’t justify a rating of 7: I give Ginza Sushi in Yorkville a 6.5/10. I tried most of the special rolls. The Moscow reminds me of a chicken burger from Mcdonalds or Kfc. Crispy outside like that of a fried chicken breast and then the sauce was like a lot of mayo. Their special rolls at the least are huge. Order 6 sweet shrip sashimi today, four pieces still has that dreaded black tract down the back of the shrimps (some may call those POOP). 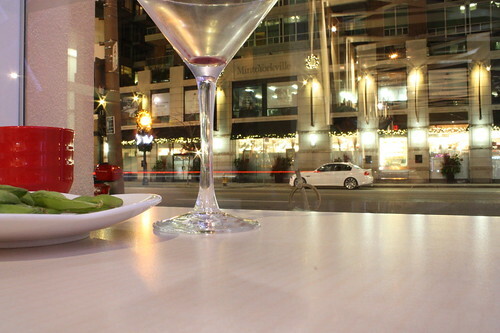 Now, would you go to a place that serves cheap quality sushi, but gets charged with yorkville price? Also their sashimi is not fresh but frozen, go to yonge street if you want sushi this quality and get it for the price that it should be at. will not be returning for sure.